Here's a Bible storybook that doesn't shy away from those strange, mysterious, and just plain weird bits of Scripture. Kids will love the offbeat style of both text and pictures, and gain a fresh appreciation for the wonderful variety found in God's Word! Ages 4-7. 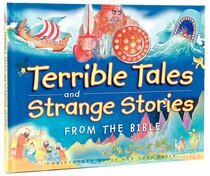 About "Terrible Tales and Strange Stories From the Bible"
A former primary school head teacher, Christopher Doyle now works both as a technical author for a branch of the civil service and a children's writer. Chris has led church youth group activities, written and performed summer events for Sunday school, and led worship sessions at youth house parties. He now lives in Somerset in the southwest of England with his wife and two children.